Ecology is essentially the study of the Earth's organisms and their relationships with their abiotic and biotic environments. Ecology or ecological science, is the scientific study of the distribution and abundance of living organisms and how these properties are affected by interactions between the organisms and their environment. The environment of an organism includes both the physical properties, which can be described as the sum of local abiotic factors like climate and geology, as well as the other organisms that share its habitat. Ecology may be more simply defined as the relationship between living organisms and their abiotic and biotic environment or as "the study of the structure and function of nature" (Odum 1971). In this later case, structure includes the distribution patterns and abundance of organisms, and function includes the interactions of populations, including competition, predation, symbiosis, and nutrient and energy cycles. The term ecology (oekologie) was coined in 1866 by the German biologist Ernst Haeckel. The word is derived from the Greek oikos ("household," "home," or "place to live") and logos ("study")—therefore, "ecology" means the "study of the household of nature." The name is derived from the same root word as economics (management of the household), and thus ecology is sometimes considered the economics of nature, or, as expressed by Ernst Haeckel, "the body of knowledge concerning the economy of nature" (Smith 1996). The interactions between living organisms and their abiotic and biotic environments, the focus of ecology, generally convey an overall sense of unity and harmony in nature. See for instance, species interactions. On the other hand, the history of the science itself has often revealed conflicts, schisms, and opposing camps, as ecologists took different approaches and often failed to meet on common ground. Ecology is usually considered a branch of biology, the general science that studies living and once-living organisms. Organisms can be studied at many different levels, from proteins and nucleic acids (in biochemistry and molecular biology), to cells (in cellular biology), to multicellular systems (in physiology and anatomy, to individuals (in botany, zoology, and other similar disciplines), and finally at the level of populations, communities, and ecosystems, and to the biosphere as a whole. These latter strata, from populations to the biosphere, are the primary subjects of ecological inquiries. The complexity of the subject of ecological studies can be see in this river in South America, which is part of the world's largest wetland, the Pantanal. Ecology is a multi-disciplinary science. Because of its focus on the higher levels of the organization of life on earth and on the interrelations between organisms and their environment, ecology draws heavily on many other branches of science, especially geology and geography, meteorology, pedology, chemistry, and physics. Thus, ecology is said to be a holistic science, one that overarches older disciplines, such as biology, which in this view become sub-disciplines contributing to ecological knowledge. Agriculture, fisheries, forestry, medicine, and urban development are among human activities that would fall within Krebs' (1972: 4) explanation of his definition of ecology: "where organisms are found, how many occur there, and why." The term ecology is sometimes confused with the term environmentalism. Environmentalism is a social movement aimed at the goal of protecting natural resources or the environment, and which may involve political lobbying, activism, education, and so forth. Ecology is the science that studies living organisms and their interactions with the environment. As such, ecology involves scientific methodology and does not dictate what is "right" or "wrong." However, findings in ecology may be used to support or counter various goals, assertions, or actions of environmentalists. The behavioral relationship between individuals of a species is behavioral ecology—for example, the study of the queen bee, and how she relates to the worker bees and the drones. The organized activity of a species is community ecology; for example, the activity of bees assures the pollination of flowering plants. Bee hives additionally produce honey, which is consumed by still other species, such as bears. The relationship between the environment and a species is environmental ecology—for example, the consequences of environmental change on bee activity. Bees may die out due to environmental changes. The environment simultaneously affects and is a consequence of this activity and is thus intertwined with the survival of the species. And ecolinguistics, which looks at the relation between ecology and language. Animal ecology, plant ecology, insect ecology, human ecology, and so forth. Arctic ecology (or polar ecology), tropical ecology, desert ecology, aquatic ecology, terrestrial ecology, wetland ecology, and temperate zone ecology. Theoretical ecology and applied ecology (including such subfields as landscape ecology, conservation biology, and restoration ecology). Ecology is a very broad-ranging and complex topic, and even its definition lacks consensus. Thus, there are numerous concepts that fit within this discipline, and diverse manners in which the content can be arranged and studied. Several of the basic concepts of ecology include ecological units, the ecosystem, energy flow, nutrient cycles, species interaction, productivity, and ecological challenges. For modern ecologists, ecology can be studied at several levels: population level (individuals of the same species), biocenosis level (or community of species), ecosystem level, biome level, and biosphere level. The outer layer of the planet Earth can be divided into several compartments: the hydrosphere (or sphere of water), the lithosphere (or sphere of soils and rocks), and the atmosphere (or sphere of the air). 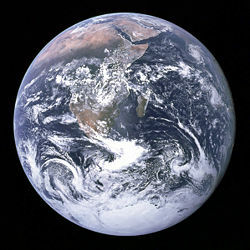 The biosphere (or sphere of life), sometimes described as "the fourth envelope," is all living matter on the planet or that portion of the planet occupied by life. It reaches well into the other three spheres, although there are no permanent inhabitants of the atmosphere. Most life exists on or within a few meters of the Earth's surface. Relative to the volume of the Earth, the biosphere is only the very thin surface layer that extends from 11,000 meters below sea level to 15,000 meters above. It is thought that life first developed in the hydrosphere, at shallow depths, in the photic zone (the area of water exposed to sufficient sunlight for photosynthesis). Multicellular organisms then appeared and colonized benthic zones. Terrestrial life developed later, after the ozone layer protecting living beings from UV rays formed. Diversification of terrestrial species is thought to be increased by the continents drifting apart, or alternately, colliding. Biodiversity is expressed at the ecological level (ecosystem), population level (intraspecific diversity), species level (specific diversity), and genetic level. Recently, technology has allowed the discovery of the deep ocean vent communities. This remarkable ecological system is not dependent on sunlight but bacteria, utilizing the chemistry of the hot volcanic vents, as the base of its food chain. The biosphere contains great quantities of elements such as carbon, nitrogen, and oxygen. Other elements, such as phosphorus, calcium, and potassium, are also essential to life, yet are present in smaller amounts. At the ecosystem and biosphere levels, there is a continual recycling of all these elements, which alternate between their mineral and organic states. 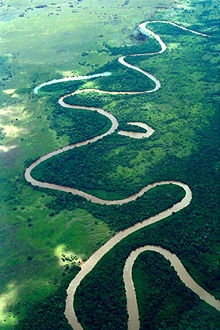 A biome is a homogeneous ecological formation that exists over a vast region, such as tundra or steppes. The biosphere comprises all of the Earth's biomes—the entirety of places where life is possible—from the highest mountains to the depths of the oceans. Biomes correspond rather well to subdivisions distributed along the latitudes, from the equator towards the poles, with differences based on the physical environment (for example, oceans or mountain ranges) and on the climate. Their variation is generally related to the distribution of species according to their ability to tolerate temperature and/or dryness. For example, one may find photosynthetic algae only in the photic part of the ocean (where light penetrates), while conifers are mostly found in mountains. Though this is a simplification of a more complicated scheme, latitude and altitude approximate a good representation of the distribution of biodiversity within the biosphere. Very generally, biodiversity is greater near the equator (as in Brazil) and decreases as one approaches the poles. The biosphere may also be divided into ecozones, which are biogeographical and ecological land classifications, such as Neartic, Neotropic, and Oceanic. Biozones are very well defined today and primarily follow the continental borders. Ecological factors that can affect dynamic change in a population or species in a given ecology or environment are usually divided into two groups: biotic and abiotic. Biotic factors relate to living organisms and their interactions. A biotic community is an assemblage of plant, animal, and other living organisms. Natural disasters can also be considered abiotic. 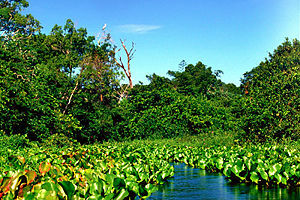 Ecologists study ecosystems such as this section of the Salobra River in the Pantanal area of Brazil. Some consider the ecosystem (abbreviation for "ecological system") to be the basic unit in ecology. An ecosystem is an ecological unit consisting of a biotic community together with its environment. 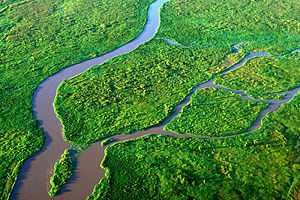 Examples include a swamp, a meadow, and a river. It is generally considered smaller than a biome ("major life zone"), which is a large, geographic region of the earth's surface with distinctive plant and animal communities. A biome is often viewed as a grouping of many ecosystems sharing similar features, but is sometimes defined as an extensive ecosystem spread over a wide geographic area. The first principle of ecology is that each living organism has an ongoing and continual relationship with every other element that makes up its environment. The ecosystem is composed of two entities, the entirety of life (the community, or biocoenosis) and the medium that life exists in (the biotope). Within the ecosystem, species are connected and dependent upon one another in the food chain, and exchange energy and matter between themselves and with their environment. How could the colonization of a barren area be carried out? What are the ecosystem's dynamics and changes? How does an ecosystem interact at local, regional, and global scale? One focus of ecologists is to study the flow of energy, a major process linking the abiotic and biotic constituents of ecosystems. While there is a slight input of geothermal energy, the bulk of the functioning of the ecosystem is based on the input of solar energy. Plants and photosynthetic microorganisms convert light into chemical energy by the process of photosynthesis, which creates glucose (a simple sugar) and releases free oxygen. Glucose thus becomes the secondary energy source that drives the ecosystem. Some of this glucose is used directly by other organisms for energy. Other sugar molecules can be converted to other molecules such as amino acids. Plants use some of this sugar, concentrated in nectar, to entice pollinators to aid them in reproduction. See ecosystem for a more extensive explanation of energy flow in ecosystems. Ecologists also study the flow of nutrients in ecosystems. Whereas energy is not cycled, nutrients are cycled. Living organisms are composed mainly of carbon, oxygen, hydrogen, and nitrogen, and these four elements are cycled through the biotic communities and the geological world. These permanent recyclings of the elements are called biogeochemical cycles. Three fundamental biogeochemical cycles are the nitrogen cycle, the water cycle, and the carbon-oxygen cycle. Another key cycle is the phosphorus cycle. Water is also exchanged between the hydrosphere, lithosphere, atmosphere, and biosphere. The oceans are large tanks that store water; they ensure thermal and climatic stability, as well as the transport of chemical elements thanks to large oceanic currents. Biocenose, or community, is a group of populations of plants, animals, and microorganisms. Each population is the result of procreations between individuals of same species and cohabitation in a given place and for a given time. When a population consists of an insufficient number of individuals, that population is threatened with extinction; the extinction of a species can approach when all biocenoses composed of individuals of the species are in decline. In small populations, consanguinity (inbreeding) can result in reduced genetic diversity that can further weaken the biocenose. 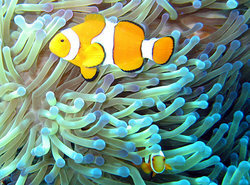 Mutual symbiosis between clownfish that dwell among the tentacles of tropical sea anemones, protects the anemone from anemone-eating fish, and in turn the stinging tentacles of the anemone protects the clownfish from its predators. Biotic ecological factors influence biocenose viability; these factors are considered as either intraspecific or interspecific relations. Intraspecific relations are those which are established between individuals of the same species, forming a population. They are relations of cooperation or competition, with division of the territory, and sometimes organization in hierarchical societies. Interspecific relations—interactions between different species—are numerous, and are usually described according to their beneficial, detrimental, or neutral effect (for example, mutualism or competition). Symbiosis refers to an interaction between two organisms living together in more or less intimate association. A significant relation is predation (to eat or to be eaten), which leads to the essential concepts in ecology of food chains (for example, the grass is consumed by the herbivore, itself consumed by a carnivore, itself consumed by a carnivore of larger size). A high predator-to-prey ratio can have a negative influence on both the predator and prey biocenoses in that low availability of food and high death rate prior to sexual maturity can decrease (or prevent the increase of) populations of each, respectively. Other interspecific relations include parasitism, infectious disease, and competition for limiting resources, which can occur when two species share the same ecological niche. Decomposers—bacteria, mushrooms, which degrade organic matter of all categories, and restore minerals to the environment. These relations form sequences in which each individual consumes the preceding one and is consumed by the one following, in what are called food chains or food networks. The existing interactions between the various living beings go along with a permanent mixing of mineral and organic substances, absorbed by organisms for their growth, their maintenance, and their reproduction, to be finally rejected as waste. The interactions and biogeochemical cycles create a durable stability of the biosphere (at least when unchecked human influence and extreme weather or geological phenomena are left aside). This self-regulation, supported by negative feedback controls, supports the perenniality of the ecosystems. It is shown by the very stable concentrations of most elements of each compartment. This is referred to as homeostasis. The ecosystem also tends to evolve to a state of ideal balance, reached after a succession of events, the climax (for example, a pond can become a peat bog). Overall, the interactions of organisms convey a sense of unity and harmony (see Biology:Interactions). Plants, through photosynthesis, use carbon dioxide and provide oxygen, while animals use oxygen and give off carbon dioxide. On the level of the food web, plants capture the sun's energy and serve as food for herbivores, which serve as food for carnivores, and ultimately top carnivores. Decomposers (bacteria, fungi, etc.) break down organisms after they die into minerals that can be used by plants. The harmony of species’ interactions with other species and the environment, including the biogeochemical cycles, have proposed a theory by some that the entire planet acts as if one, giant, functioning organism (the Gaia theory). Lynn Margulis and Dorion Sagan in their book Microcosmos (1997) even propose that evolution is tied to cooperation and mutual dependence among organisms: "Life did not take over the globe by combat, but by networking." The observed harmony can be attributed to the concept of dual purpose: the view that every entity in the universe in its interactions simultaneously exhibits purposes for the whole and for the individual—and that these purposes are interdependent. "Individual purpose" refers to the individual's requirement to met basic needs of self-preservation, self-strengthening, multiplication, and development. The "whole purpose" is that by which the individual contributes to the preservation, strengthening, and development of the larger entity of which it is a part. Thus, the cell of a multicellular body provides a useful function for the body of which it is part. This "whole purpose," which could be the secretion of an enzyme, harmonizes with the body's requirement of self-preservation, development, self-strengthening, and reproduction. The body, on the other hand, supports the cell's "individual purpose" by providing essential nutrients and carrying away wastes, assisting the cell's self-preservation, self-strengthening, multiplication, and development. Likewise, each individual organism exhibits both an individual purpose and a purpose for the whole related to its place in the environment. The result is an extraordinary harmony evident in creation. The concepts dealing with the movement of energy through an ecosystem (via producers, consumers, and decomposers) lead to the idea of biomass (the total living matter in a given place), of primary productivity (the increase in the mass of plants during a given time), and of secondary productivity (the living matter produced by consumers and the decomposers in a given time). These two last ideas are key, since they make it possible to evaluate the load capacity—the number of organisms which can be supported by a given ecosystem. In any food network, the energy contained in the level of the producers is not completely transferred to the consumers. Thus, from an energy point of view, it is more efficient for humans to be primary consumers (to get nourishment from grains and vegetables) than as secondary consumers (from herbivores such as beef and veal), and more still than as tertiary consumers (from eating carnivores). Humanity's actions over the last few centuries have reduced the amount of the Earth covered by forests (deforestation), and have increased agro-ecosystems (agriculture). In recent decades, an increase in the areas occupied by extreme ecosystems has occurred (desertification). Generally, an ecological crisis is what occurs when the environment of a species or a population evolves in a way unfavorable to that species' survival. It may be that environment quality degrades compared to the species needs, after a change in an abiotic ecological factor (for example, an increase of temperature, less significant rainfalls). It may be that the environment becomes unfavorable for the survival of a species (or a population) due to an increased pressure of predation (e.g., overfishing). It may be that the situation becomes unfavorable to the quality of life of the species (or the population) due to a rise in the number of individuals (overpopulation). Although ecological crises are generally considered to be something that occurs in a short time span (days, weeks, or years), by definition, ecological crises can also be considered to occur over a very long time period, such as millions of years. They can also be of natural or anthropic origin. They may relate to one unique species or to many species (see the article on extinction). 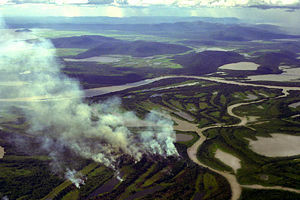 People often use fires to clear land for agriculture or grazing livestock in the Pantanal. Lastly, an ecological crisis may be local (an oil spill, a fire, or eutrophication of a lake), widespread (the movement of glaciers during an ice age), or global (a rise in the sea level). According to its degree of endemism, a local crisis will have more or less significant consequences, from the death of many individuals to the total extinction of a species. Whatever its origin, disappearance of one or several species often will involve a rupture in the food chain, further impacting the survival of other species. Of course, what is an ecological crisis to one species, or one group of species, may be beneficial or neutral with respect to other species, at least short-term. In the case of a global crisis, the consequences can be much more significant; some extinction events showed the disappearance of more than 90 percent of existing species at that time. However, it should be noted that the disappearance of certain species, such as the dinosaurs, by freeing an ecological niche, allowed the development and the diversification of the mammals. An ecological crisis may benefit other species, genera, families, orders, or phyla of organisms. Sometimes, an ecological crisis can be a specific and reversible phenomenon at the ecosystem scale. But more generally, the crisis’ impact will last. Indeed, it rather is a connected series of events that occur until a final point. From this stage, no return to the previous stable state is possible, and a new stable state will be set up gradually. Lastly, if an ecological crisis can cause extinction, it can also more simply reduce the quality of life of the remaining individuals. Thus, even if the diversity of the human population is sometimes considered threatened (see in particular indigenous people), few people envision human disappearance at short span. However, epidemic diseases, famines, impact on health of reduction of air quality, food crises, reduction of living space, accumulation of toxic or non-degradable wastes, threats on key species (great apes, pandas, whales) are also factors influencing the well-being of people. The nuclear meltdown at Chernobyl in 1986 that caused the death of many people and animals from cancer, and caused mutations in a large number of animals and people. The area around the plant is now abandoned because of the large amount of radiation generated by the meltdown. Ecology is generally spoken of as a new science, having only become prominent in the second half of the twentieth century. Nonetheless, ecological thinking at some level has been around for a long time, and the principles of ecology have developed gradually, closely intertwined with the development of other biological disciplines. There is no consensus on its beginnings, as it developed more like a multi-stemmed bush than a tree with a single trunk (Smith 1996). Thus, one of the first ecologists may have been Aristotle or perhaps his friend and associate, Theophrastus, both of whom had interest in many species of animals. Theophrastus described interrelationships between animals and between animals and their environment as early as the fourth century B.C.E. (Ramalay 1940). In general, the modern movement to ecology through botanical geography (which led to plant ecology) developed earlier than animal ecology. Throughout the eighteenth and the beginning of the nineteenth century, the great maritime powers such as Britain, Spain, and Portugal launched many world exploratory expeditions. These expeditions were joined by many scientists, including botanists, such as the German explorer Alexander von Humboldt. Humboldt is often considered a father of ecology. He was the first to take on the study of the relationship between organisms and their environment. He exposed the existing relationships between observed plant species and climate, and described vegetation zones using latitude and altitude, a discipline now known as geobotany. With the publication of the work of Charles Darwin on The Origin of Species, ecology passed from a repetitive, mechanical model to a biological, organic, and hence evolutionary model. Alfred Russel Wallace, contemporary and competitor to Darwin, was first to propose a "geography" of animal species. Several authors recognized at the time that species were not independent of each other, and grouped them into plant species, animal species, and later into communities of living beings or "biocoenosis." This term, which comes from Greek, was coined in 1877 by marine biologist Karl Möbius, and essentially means "life having something in common." By the nineteenth century, ecology blossomed due to new discoveries in chemistry by Lavoisier and Horace-Bénédict de Saussure, notably the nitrogen cycle. After observing the fact that life developed only within strict limits of each compartment that makes up the atmosphere, hydrosphere, and lithosphere, the Austrian geologist Eduard Suess proposed the term biosphere in 1875. He used the name biosphere for the conditions promoting life, such as those found on Earth, which include flora, fauna, minerals, matter cycles, and so forth. In the 1920s, Vladimir Vernadsky, a Russian geologist who had defected to France, detailed the idea of the biosphere in his work The biosphere (1926), and described the fundamental principles of the biogeochemical cycles. Ecological damages were reported in the eighteenth century, as the multiplication of colonies impacted deforestation. Since the nineteenth century, with the Industrial Revolution, more and more pressing concerns have grown about the impact of human activity on the environment. The term ecologist has been in use since the end of the nineteenth century. Over the nineteenth century, botanical geography and zoogeography combined to form the basis of biogeography. This science, which deals with habitats of species, seeks to explain the reasons for the presence of certain species in a given location. Pioneers in animal ecology were early twentieth-century scientists R. Hesse and Charles Eton, Charles Adams, and Victor Shelford. It was in 1935 that Arthur Tansley, the British ecologist, coined the term ecosystem, the interactive system established between the biocoenosis (the group of living creatures), and their biotope (the environment in which they live). Ecology thus became the science of ecosystems. Tansley's concept of the ecosystem was adopted by the energetic and influential biology educator Eugene Odum. Along with his brother, Howard Odum, Eugene Odum wrote a textbook which (starting in 1953) educated multiple generations of biologists and ecologists in North America. At the turn of the twentieth century, Henry Chandler Cowles was one of the founders of the emerging study of "dynamic ecology," through his study of ecological succession at the Indiana Dunes, sand dunes at the southern end of Lake Michigan. Here Cowles found evidence of ecological succession in the vegetation and the soil with relation to age. Ecological succession is the process by which a natural community moves from a simpler level of organization to a more complex community (e.g., from bare sand, to grass growing on the sand, to grass growing on dirt produced from dead grass, to trees growing in the dirt produced by the grass). Human ecology began in the 1920s, through the study of changes in vegetation succession in the city of Chicago, Illinois. It became a distinct field of study in the 1970s. This marked recognition that humans, who had colonized all of the Earth's continents, were a major ecological factor. Humans greatly modify the environment through the development of the habitat (in particular urban planning), by intensive activities such as logging and fishing, and as side effects of agriculture, mining, and industry. Besides ecology and biology, this discipline involved many other natural and social sciences, such as anthropology and ethnology, economics, demography, architecture and urban planning, medicine and psychology, and many more. The development of human ecology led to the increasing role of ecological science in the design and management of cities. The history of ecology has been one of conflicts and opposing camps. Smith (1996) notes that the first major split in ecology was between plant ecology and animal ecology, which even lead to a controversy over the term ecology, with botanists dropping the initial "o" from oecology, the spelling in use at the time, and zoologists refusing to use the term ecology at all, because of its perceived affiliation with botany. Other historical schisms were between organismal and individualist ecology, holism versus reductionism, and theoretical versus applied ecology. Ramalay, Francis. 1940. "The growth of a science." Univ. Colorado Stud. 26: 3-14. This page was last modified on 21 March 2017, at 23:32.